Traditionally, a Witness Tree was a surveying tool to mark a section or quarter section for mapping purposes. This tree is located on the original highway between Philadelphia and Pittsburgh. On Oct 25, 1794, it has been documented that George Washington was here because one of the horses in his entourage threw a shoe. The Tate's were the local blacksmiths. Of course, the 1863 date reflects the Battle of Hunterstown, part of the battles of Gettysburg. I imagine the tree has witnessed many things perhaps someone's first stolen kiss, or the burying of a beloved pet. The 150th Anniversary of the Battle of Gettysburg was commemorated this year, 2013. There have been reenactments and encampments from here to Gettysburg this summer. Our town, Mechanicsburg is noted to be the furthest North the Confederates advanced until the troops were called back to Gettysburg. Our town had no soldiers here to battle, so the Mayor quickly conceded. Last month Mechanicsburg held some commemorative programs and events to honor all who battled in the Civil War. At The Rosemary House and Sweet Remembrances, we scheduled a special event where we learned the fascinating tale of Clara Barton, affectionately known as the Angel of the Battlefield. Nancy made a Salad of Fresh Fruits and Flowers of the Field dressed with Mary Todd Lincoln's Raspberry Vinaigrette. A tall glass of Iced Sassafras Tea accompanied the salad course. Sandwiches included General Grant's Cucumber and Chive Tea Sandwich. It has been observed that General Grant often made an entire meal of sliced cucumbers and coffee! 1896 Waldorf Chicken Salad Sandwich, Plantation Corn Muffins with Calendula Blossoms & Pepperelli, Southern Chedder Cheese & Pecan Sandwich, Company 'H' Hard Tack, and Tangy Orange Spread with pecan Date Bread. Traditional English Cream Scones with Sweet Cream and Lemon Curd were served along side Northern Rose Geranium Muffins, Fresh Orange slices and Strawberry with Mascarpone Cheese. Dessert featured a Red Cross Shortbread Cookie, Elderberry jelly Thumbprint Cookie and Abe Lincoln's Frosted Gingerbread Cookie. Clara Barton told us her life story. While she wasn't at the Battle of Gettysburg, she was of course instrumental in starting the American Red Cross and for making it an organization of aid during peacetime disaster as well as during wartime. Clarissa Harlowe Barton is the most famous American nurse who was not really a nurse, although she was the first American woman to serve directly on the battlefields as a nurse. One of our annual summer events is when we welcome Rhonda Shomper of Dancing Moon Beam. She is an amazing Spiritual Intuitive Tarot Card Reader. She uses channeling, empathy, tarot cards and intuition, whatever comes through to do your reading. We serve a very leisurely tea party and one by one the guests file outside to the side porch to have their private reading. to leave to have your reading done. In particular it is always hard to walk away from the scone course and the dessert course. But Rhonda is such an amazing intuitive reader that it is worth it. Serve with Sweet Cream and Lemon Curd! A special thank you to Tina Sams of The Essential Herbal for sharing this delightful and delicious gluten free lavender Shortbread recipe recently on her blog and on the Facebook page. We had fun serving these to a very special guest that recently visited Sweet Remembrances. You can find the recipe on The Essential Herbal blog, here. Tina shares the original recipe, and then her adaptations to make it even better! Be sure to follow the adapted recipe. Prior to serving these, I used a simple confectioner's sugar/milk glaze to add a touch of additional sweet flavor and moisture to them. This little fairy garden at Willow Oak Herb and Flower Farm was sprinkled not just with trinkets and homes for the fairies but with poems to read and meditate on. 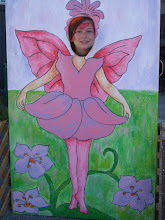 I thought it was fun to have the literary works referring to the fairies tied in with her fairy garden designs. For additional Fairy poems, visit this site. Tea Time at Sweet Remembrances! SereniTea Wednesday! Salad first, and then the three tiered tray laden with tea time treats. Sandwiches this week include Pineapple and Kiwi Rounds, Chicken Salad with lettuce on white bread, Savory Cheese Spiral with chives and pine nuts, and Garden Fresh Sandwiches with a herbed cheese, cucumbers and radishes on puff pasty. The scones, Traditional English Cream, and Apricot Walnut. Warm and fresh from the oven, served with Sweet Cream and Raspberry Preserves. And for dessert, Raspberry thumbprint cookies, Coconut Frosted Butter Cookies, and miniature Zucchini cake. Oh, yum! Wandering through town I spotted this little culinary herb garden on the side porch of a restaurant. Instantly, a number of thoughts went through my head. 1) A restaurant that uses fresh herbs, knows good flavors. 2) This is a good use of this little porch space. 3) It doesn't take a lot of space to have the flavor of fresh herbs at your fingertips. Nancy's little culinary garden is only 4 feet by 6 feet, located right outside the kitchen door, and produces most all of the herbs she needs. Wow! Just wow! This isn't ours but I wish it was. This is our vintage bathtub filled with native Black Eyed Susanna's and a few native Echinacea plants. It has taken a few years for it to fill in but now it is a colorful wildflower garden and a focal point in this part of our yard. This garden room plays host to all sorts of vintage items, bathtubs, wringer washers, aluminum wash tubs and lunch pails, milk boxes and more -- Susanna calls it the "Funky garden" and Nancy refers to it as the "Yard Sale" garden. Of 'course a few tea things have made it into the yard. All have chips or cracks, no useable tea cups have been harmed in the making of this garden bed, instead the broken ones have been given a home where they are still admired on a regular basis! What a charming little path. This enticed me to take a wander down the path just to see what I could find. So fragrant and colorful and not that large really, daylilies, lavender, dianthus and others. Mostly, all in bloom at the same time. Where does the path take you today? It's always such a joy when we have the opportunity to visit a tea room! We love tea rooms, working in them, visiting them, experiencing them and supporting them! We recently had the opportunity to visit the Harmony Tea Room in Westwood, NJ. Located in the bustling community of Westwood at 11 Bergen Street, we arrived promptly for our reservations. Such a lovely variety of china graced the tables. We all selected our own pot of tea from a list of about 20 teas, that included many black teas, a few green, decaf, rooibos, and tisanes or iced tea if you prefer. Camouflaged young Cedar enjoyed lemonade in his cup. The soup course featured a choice of two options, shown here, a hearty portion of roasted red pepper soup. There were two salad options also. Most at our table selected the fresh leafy green salad with assorted greens, pecans, and cheese delicately dressed with a raspberry vinaigrette. and a variety of petite desserts. It was a delightful afternoon tea! This lovely Native American Tree, produces a tasty and edible fruit that you can use to make jellies, or berry pies just to eat. 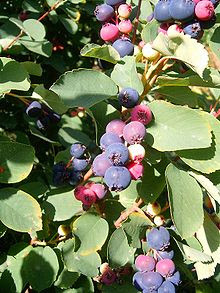 It has lots of other names: Juneberry, because that is when it is in berry. Serviceberry, because when it blooms in the spring the ground has thawed enough the preacher can get over the mountain to hold services (or because the ground has thawed enough to dig the graves and hold funeral services). It is also called Shad Buck, because it bears fruit when the Shad are running. In Canada it is called Saskatoon, and I have heard it called Wild Plum, too. 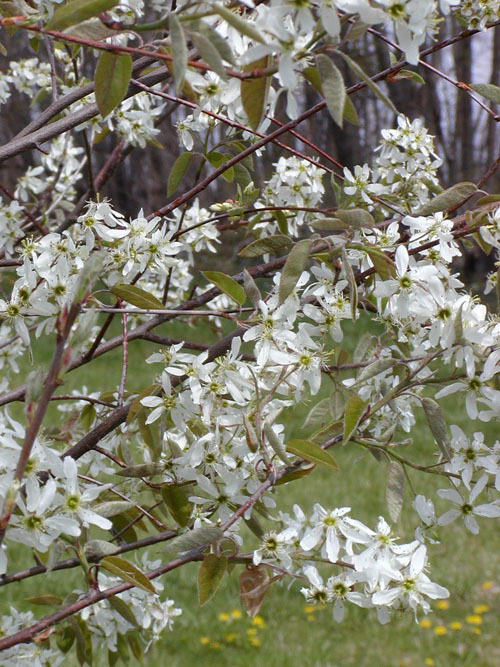 Amelanchier is a tree that grows in the Northern Hemisphere, especially in the Northeast and up into Canada. It is a beautiful white flowered plant with tasty little fruit. The fruits aren't available for very long, which is part of the reason you don't find them in the marketplace. Little tip: All berries with a crown are edible - blueberries, serviceberries. This fun tea time chandelier was hanging in a tea room we visited recently during our vacation travels. Such a clever way to use chipped or cracked tea cups! Do you have a handyman in your household that might perhaps craft one for you? Fairies, Children, Adults? What tea party did we stumble upon? It looks as though they left fairly quickly...... We didn't mean to interrupt. Rosemary Harris , author of the Dirty Business Mystery Series was recently at The Rosemary House for a book signing and tea party. Her sleuth is a Master Gardener and runs her own landscaping business. This cozy mystery series has clever titles such as "Pushing up Daisies" and "Dead Head". Well written and peppered with gardening trivia and tips it is delightful light summertime reading. Nancy created another of her signature Afternoon Tea events for everyone to enjoy after the book signing. For starters, a Sleuth's Favorite Strawberry Soup, garnished with rose petal confetti and a fresh mint leaf. Everything was fresh and seasonal, perfect for a gardener's tea. The sandwich platter included a Tomato Basil Sandwich, The Flower Show Murders May Flower Sandwich, Spinach & Artichoke Phyllo Shell, Goat Cheese and Herbed Triangle, Roast Beef with Parmesan Mayonnaise on a Lemon Pepper Muffin, and Rosemary's Poppyseed Rollups. Scones included a Lavender Scone with Sweet Cream, Orange Glazed Poppyseed Tea Bread, and an Almond Cream Filled Strawberry. The dessert medley included Lemon Verbena Cheesecake, Pushing Up Daisies Chocolate Cream Cupcake, and Mysterious White and Dark Chocolate Truffles. After dessert Rosemary Harris, presented a program on Mischief and Mayhem in the Garden. A series of cute little stories about her own garden, her sleuth's garden, and plant trivia. Rosemary Harris is a charming person and Rosemary House was lucky to be able to host her. She stated on her way out the door "This was one of her top 3 favorite book signings!". What an honor.